Movavi Slideshow Creator is an efficient easy-to-use tool which turns your photo memories into breathing movies. All you need to do it to follow three picnic steps: select photos, overlay music & add transitions... then sit back and enjoy. Or share your video memories in multiple ways: save into any format & for any portable device, burn on CDs/DVDs. 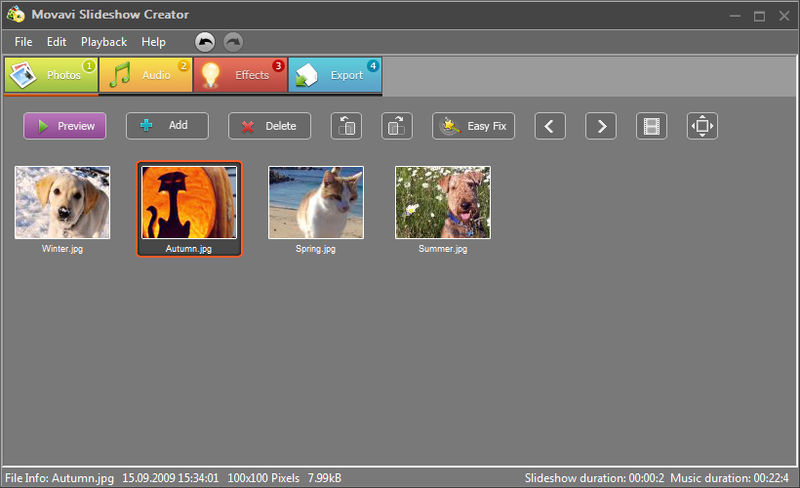 Movavi Slideshow Creator offers a rich selection of formats in which to save your masterpiece. Hier gehts weiter zum Movavi Slideshow Creator Download. Kaufe Movavi Slideshow Creator jetzt einfach in einem unserer Partner-Shops. Das Herunterladen der Software Movavi Slideshow Creator 1.1.20 ist kostenlos (ausgenommen natürlich die Kosten für den Internetanschluss und die Internetnutzung). Für die Nutzung der Software gelten jedoch die Lizenzbedingungen des Herstellers/Anbieters.